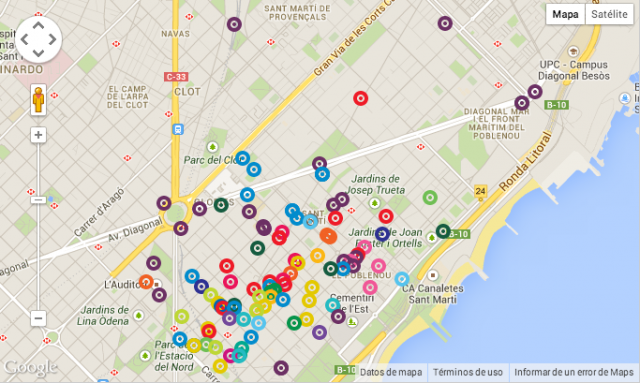 Poblenou is the neuralgic point of the city for design and production studios. The perfect area, with large spaces, to settle around creativity, since this is where everything is cooked. 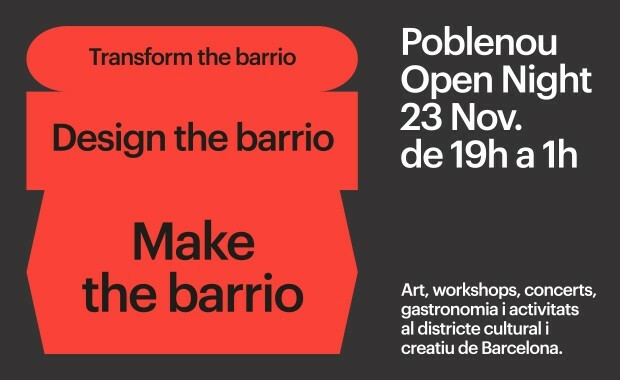 For Poblenou Open Night, the spaces for design, communication and production open their doors to the public to offer a set of activities where you can experience first hand the method of work, inspiration and creation of audiovisual ideas. Also attend talks, meet the artists, participate in activities … and much more! Open doors of the workshop with exhibition of ongoing projects: furniture, facilities, product, prototypes, etc. Sale of products of the brand ‘Objects by Medium’ with special discount of 15%. Music, beers and some more surprises. Inauguration of Node! The space dedicated to design and communication will present its latest designs with live music and its incredible Led Mappings! Do not miss it! The gastronomic space presents Showcooking with 3 chefs! Roc35 presents a scandal programming that includes the most innovative and avant-garde cuisine so you can try it! The Showcooking will be married with the best beers and live music! Discover the urban floral oasis of Allblanc! With live music by Acqustic that will bring live jazz. Plants, flowers and a floral fauna that you can enjoy with the best cocktails. They present a round table about luxury: What is luxury today, and how do we sell it? They want to reflect with the 3 invited experts on the reality of the Luxury Market. How do we create retail experiences and environments, capable of moving beyond the traditional values of luxury? What attracts new consumers of these products?Speakers: – Laura Clèries (Materfad) – Francisco Rodríguez (Estée Lauder Spain) – Amanda Pérez (Perfumes Loewe, LVMH Group). They invite you to listen in first person to those who share these doubts in their day to day professional and, of course, to give your opinion in a debate that is expected interesting. >>Sign up to reserve your place by sending an email to >>punto@puntoconsulting.com (Aforo limitado). Ptge. Ferrer i Vidal 12, bxs. Apart, a multidisciplinary space dedicated to innovation, opens its doors to present the new collection of Firmamento Azul Surf. A timeless, relaxed and radically sustainable collection. Made of organic cotton, using 100% vegetable dyeing methods and a final sand wash. Display of pieces, music and beer. Come and meet your Brain Dome. A structure over 8 meters long and weighing 2 tons with a spectacular interactive Led Mapping system. In addition, they will have the best music and a cool beer for you. Goroka presents El Bloque TV on a night dedicated to new formats for the distribution of musical and audiovisual content. This collective reinvents a medium with a long history, live music programmes, and adapts it to the new reality of social networks. Artists such as C. Tangana, la Zowi, Yung Beef and Bad Gyal have been featured on its programme. The Bloque TV, focused on the trap scene and urban music, is broadcasted on Youtube and amplified on Instagram, claiming the role of the music of the neighbourhood, the periphery and the margins in the current music scene. After a brief presentation and a chat with its creators, the night will close with a DJ set of the collective and live performance by Aida Tibak. This is the second meeting of #OpenGoroka, an open format about storytelling, innovation and collaboration. Do you want to discover a set inside? Open house on the set of his producer with music, art and beer. Visit the Tecnoart press and discover how a printing company is with a guided tour through the music of their Dj set! They will have a small personalized detail for the attendees. They open the doors of their communication studio so you can discover their space with live music!